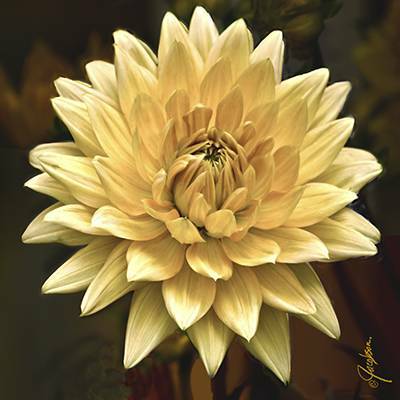 Dahlia XI painting is from the Dahlia Suite series of paintings by artist Jackie Jacobson. Jacobson photographed these flowers in the Northwest as they bloomed profusely in August. The colors and variety totally inspired Jacobson to paint the suite. Some of the flower heads were dinner plate size, and here with Dahlia XI, it was the color that was inspiring. The dahlias are now printed on ceramic tiles. You can display the coasters on an easel as a fine art painting on tile. Then at a dinner, move them to your table for a colorful floral display. Add the tiles to your backsplash for a unique display of art and color.